These are lyrics by Wesley Willis that we think are kind of funny. 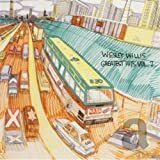 Wesley Willis', "Rock 'n' Roll Mcdonald's"
I have no Idea why but they just sound funny, for some reason, every time I hear this song, A little voice inside me tells me he's sarcastically making fun of that slightly bland ok restauraunt known as McDonalds. but doesn't anybody agree with me?